Any breakfast -- or boozy brunch -- worth its salt features at least one carton of orange juice. But surprisingly, the morning staple is weathering its roughest consumption stats in nearly two decades, and it somehow has nothing to do with its unfortunate name association with that other OJ. 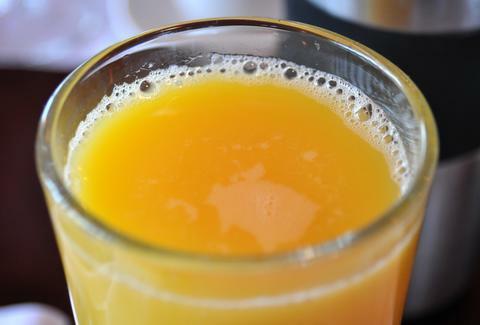 Bloomberg reports that, while orange juice is still the most popular "fruit beverage" in the US, yearly consumption is at its lowest point since 1996. And that's just the latest in a series of bad news for the drink. This marks the eighth decline in the past 10 years, a period which also saw the market shrink 21%. Their stock isn't looking so hot, either. Open interest in orange-juice futures has apparently dropped 51% in the past two years and, while we're not quite sure what that means, it sure doesn't sound good. Business types are currently blaming the downward trend on increased beverage options (sports drinks, diet sodas, Voss) as well as growing concern over sugar content (all hail aspartame). Though orange juice is still very much a multi-million industry, its bigwigs are clearly taking the dip to heart. In order to get kids bugging their Moms for OJ, the Florida Department of Citrus is planning to release one million comic books featuring "Captain Citrus" alongside Iron Man, Thor, Black Widow, and Captain America. We're not sure what kind of crime he'll be fighting, but clearly, Tropicana thieves had better watch themselves. Kristin Hunt is a Food/Drink staff writer for Thrillist, and loves orange juice, but has probably not purchased any herself in the last six months. Follow her at @kristin_hunt.